Compact and robust high viz kit. One of our favourites as it has an easy to apply, super absorbent trauma dressing that comes in a watertight package. Traumafix dressings can be applied one handed to yourself if you are injured and is secured by Velcro. 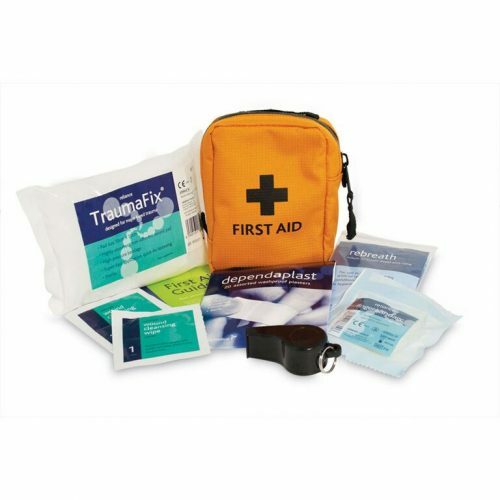 This high viz first aid kit is ideal for anyone who takes part in outdoor pursuits where space is of a premium. The robust kit is ideal for those working in Forestry or using chain saws where a personal first aid kit is mandatory. The coupon for this kit is firstaidkit The code has an expiry date and offers are limited. This entry was posted in First Aid Supplies, News and tagged first aid. Bookmark the permalink.